According to Google’s own webmasters’ article published on March 26, 2018, mobile first indexing is about how they gather content and not about how they rank content. A lot is being talked about mobile first indexing. It is the product of Google’s development efforts in making the web more mobile-friendly. 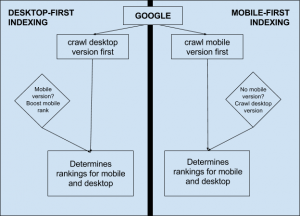 But what exactly is mobile first indexing and how does it affect our efforts in ranking our sites higher? Let’s dig in and find out. Mobile-first indexing means that Google will primarily create the index according to the mobile version of the content. Originally, Google used the desktop version of the content of the websites for the indexing and ranking purposes. But since the advent of mobile devices, a majority of the users have been accessing Google via mobile devices. That is basically why Google will now use the mobile version of a page as the starting point to index. This means that Google won’t be creating any new index but will use the same existing one. It is a mobile-first index and not a mobile-only index. So even if a certain website does not have a mobile version, it still is indexed. Clearly, the websites with better mobile-experience would be ranked higher than the one who lacks the same. With mobile first indexing the primary version, as considered for indexing, is the mobile version of your website. So in case, the website is optimized for mobile or if you use responsive design for your website then, in theory, this change from desktop first to mobile first indexing should not have much impact on the ranking of your website. According to Google’s own webmasters’ article published on March 26, 2018, mobile first indexing is about how they gather content and not about how they rank content. They have also mentioned in the same article that the content which is slow loading might perform less starting July 2018. To understand in more details how Google determines the mobile content of a website; you can refer to their developer documentation. So what should I do to make my site mobile first ready? The content on the mobile version and that on the desktop should be the same. If the content on your mobile site is less than that on your desktop site, then you should probably add some content to your mobile site. Ensure that the metadata remain equivalent across the desktop and mobile sites. The official guidelines given by google mention “equivalent” and not “same”. Include Social Media metadata such as Twitter cards, OpenGraph tags as well in both the versions of the website. Same structured data should be included on both the versions. The URLs in the structured data should be updated to mobile URLs. Insert the correct rel=canonical and rel=alternate links between the two versions of your website. Check whether your servers have enough capacity to handle a probable increase in crawl rate. In case you have only verified only the desktop version of your site, you should add and verify the mobile version of your website as well. If using hreflang tag for internationalisation, links between the mobile and desktop URLs should be separate. The mobile URLs should point to your mobile site and desktop to the desktop site. Mobile first Indexing is evidently a major change. However, it surely isn’t happening overnight. Google has been working on perfecting it for a long time now. The best we can do is take advantage of the time we have and make our websites mobile first ready so as to reap the benefits of mobile-first indexing.